JMR Spotted at Chi O Mixer | The Gettysburgian. 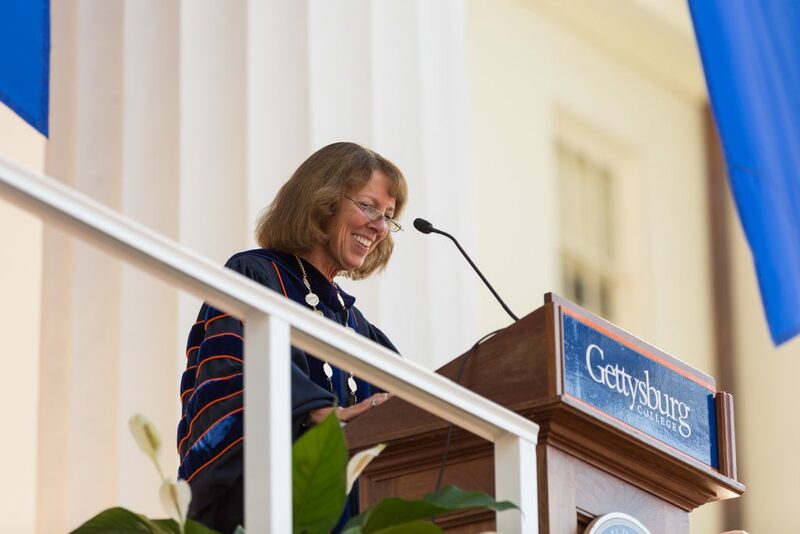 On this past Saturday night at roughly 10:37 p.m., Gettysburg College President Janet Morgan Riggs was spotted at Phi Delta Theta fraternity. JMR decided to throw it back to the days when she was a student here at Gettysburg. President Riggs had an amazing time at the Chi Omega mixer, noting that her experience being a member of the Chi O sorority has been a great part of her Gettysburg experience. She also shared with us that she discovered her “new favorite song” which is “The Middle” by Zedd, Maren Morris, and Grey. Although she was a little nervous about dancing on the radiator, she knew that it was a staple move in order for her to have a fun night out so she did it anyway. At roughly 11:15 p.m., she went up to the DJ booth and took over the aux. After doing absolute fire on aux, President Riggs decided to wrap up her set with the classic “Take Me Home, Country Roads” by John Denver for the end of an amazing night. Noelle Zimmerman '20 is an English major with a Business minor. She is a student assistant for the softball team, and she is a dog-walker. She will be traveling to Israel this summer, and studying abroad in Aix en Provence in the Fall of 2018.